Easy functional hierarchy diagram software helps you create quality functional hierarchy diagram in minutes, professional and effective. Want to map out a functional hierarchy structure of a system, but get tired of drawing shapes and lines one by one? Actually, you don't have to waste time to deal with those drawing and aligning stuff. Edraw offers an easy solution for you to make great functional hierarchy diagram. It has built-in a large collection of unit shapes, each with action buttons that allow you to add and connect sub shapes (both parallel and vertical) automatically with one click. By enabling Auto Layout, whenever you add new shapes, the software will help you reset in a perfect layout automatically. With a Microsoft-like users interface, you can save plenty of time from getting familiar with, even novice users could handle it without any hassle. 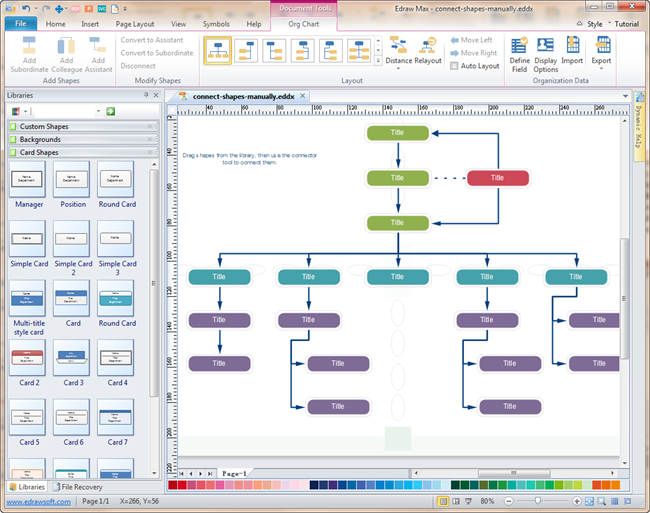 Download a free trial and see first-hand how quickly and easily you can create great-looking functional hierarchy diagrams. A functional hierarchy diagram is a diagram that presents all the functions involved in your system, which uses a hierarchical structure like an organizational chart. It's used to define the elementary functions and how functions are related to one another. Choose Organizational Chart category under Available Templates. Double click the icon of Basic Organizational Chart or Custom Organizational Chart to enter the drawing page. From the card library that on the left of the drawing page, drag a card shape on the canvas, click the action button on the right and bottom to automatically add more card shapes. Double click on the shape to edit text. To have a more detailed guide, please view the video tutorial: How to Create Organizational Chart. The interface is straightforward and easy to use, no need to learn. You don't have to draw everything on your own. Just drag the ready-made shapes from the library pane and drop them on your page. Quick add of shapes by only clicking on floating control buttons. Rich pre-made templates allow you to modify from existing templates, rather than start from scratch. Help align and layout everything perfectly with auto layout function.